If you have been reading for awhile, you know I like veggie trays. Here is my Christmas version. 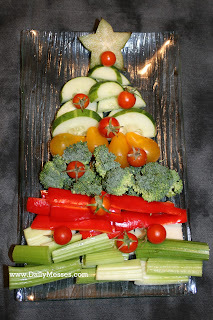 Various veggies: I used celery, red peppers, broccoli, yellow tomatoes, cucumbers, cherry tomatoes for 'lights', and a slice of starfruit for the tree topper. You could also use slices of pepperoni in the tree, other favorite vegetables, or a slice of cheese cut into a star for the tree topper. If you have sprigs of thyme or rosemary, you could also use those for strands of lights. 1. Build your tree. I found it easier to build from the base up and place the star and 'lights' on last.